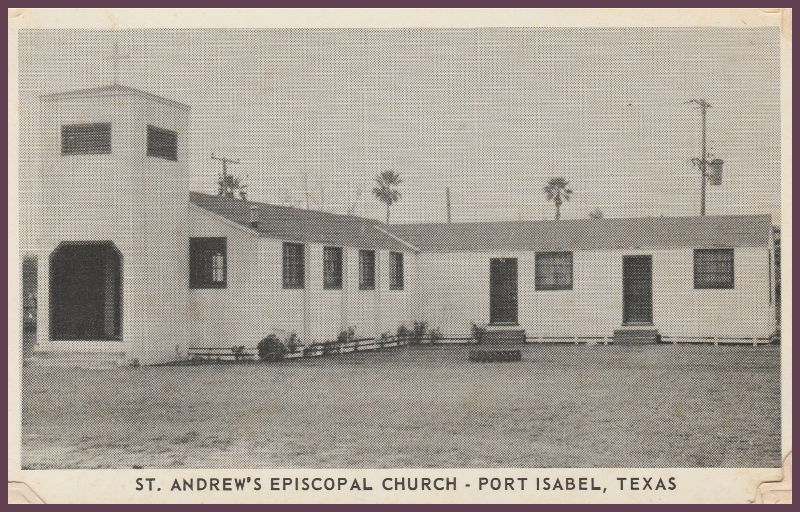 St. Andrew’s by the Sea Episcopal Church in Port Isabel, Texas, was originally organized in 1955 at the request of a group of Episcopalians interested in having a church in the area in which they could worship and educate their children. With the assistance of some local Valley clergy, the bishop was approached for permission to begin the process. He approved the endeavor, and on October 16, 1955 seven Episcopalians gathered at the home of Thelma Gambrell for Evening Prayer and an organizational meeting. 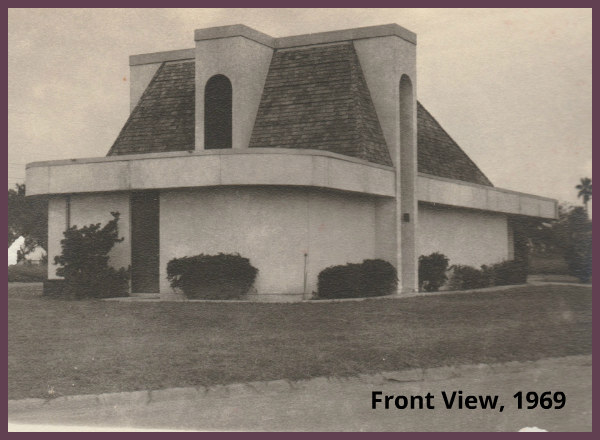 The congregation then held their first local service at the American Legion Hall on October 23, 1955. From that point on, local clergy from Brownsville and San Benito shared responsibility for services until the Reverend Branch was assigned as the church’s first vicar. Bishop Everett Jones named the church as a new mission of the diocese on March 19, 1956. 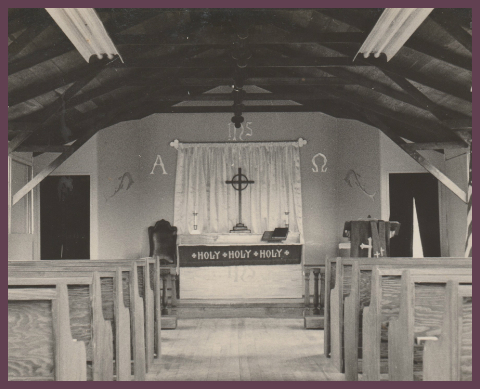 The first church structure was created in 1956 from some old World War II military barracks which were purchased and placed on a property belonging to Thelma Colley. 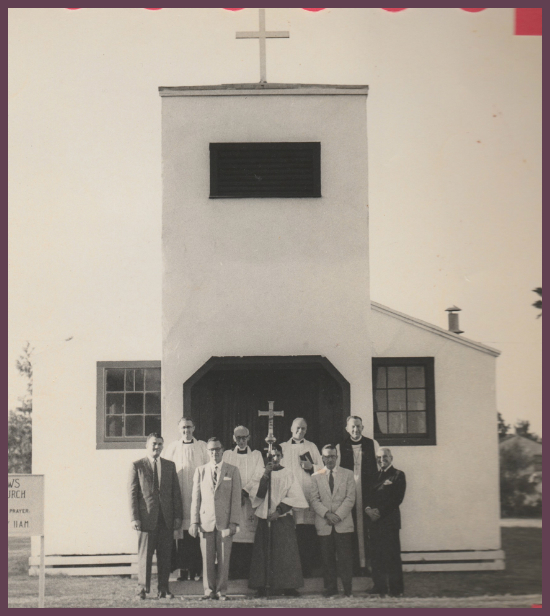 The site was dedicated on December 8, 1957 by Bishop Earl Dicus. See photo below. Photo taken by George Colley ~ ~ ~ 56 people were present for this dedication. When Hurricane Beulah hit Port Isabel in 1967, this first building was completely destroyed. After that occurred, the present permanent site of St. Andrew’s was purchased with the assistance of a diocesan advance fund. 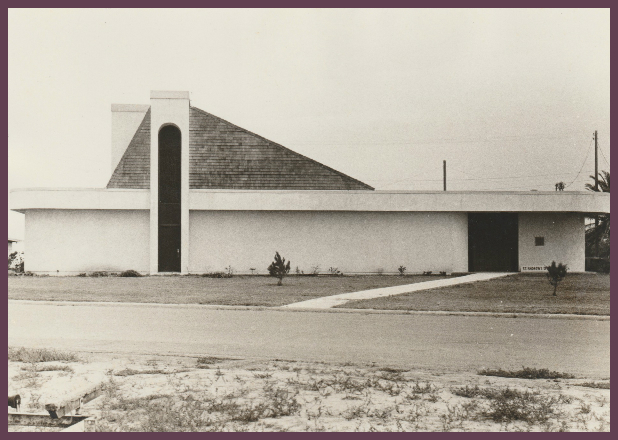 A new building was completed, and on December 8, 1969, it was dedicated by Bishop Harold Cornelious Gosnell and the vicar, The Reverend John Covey. In the following decades, the parish hall and additional class rooms were added to the original structure as St. Andrew’s grew spiritually and physically. In 1997, under the leadership of The Reverend Max Reynolds, the church progressed from mission status to parish, as we remain to this day. The Reverend Paul Abbott, Church of the Advent, Brownsville, guided St. Andrew’s from April, 1955 to June 1966. June 1955 to April 1958. Other clergy serving during some of the above years were The Reverend Leonardo Cespedes (July 1973 to August 1982) and The Right Reverend William Crittenden (November 1981). Also, through out the years, St. Andrew’s has had any number of Interim and Supply Clergy serving the Parish.